Virgin is to appeal against the European Commission’s decision to allow the owner of British Airways, IAG, to buy the airline BMI. IAG, which also owns Iberia, has been given the go-ahead to buy its smaller rival from Lufthansa for £172.5m, and the deal is expected to take effect on 20 April. But Virgin said that the Commission “seemingly ignored all of the strong cases” made against the deal. Branson criticised the Commission for reaching its conclusion in 35 working days, and the way only 12 out of the 56 daily pairs (56 is 8.5% of the total) of Heathrow slots Bmi owned will be released to other airlines. Also that the deal puts BA in a position of market dominance at one of the world’s busiest airports. Virgin will bid for all the 12 slots that BA has been forced to give up. Virgin Atlantic is to appeal against the European Commission’s decision to allow the owner of British Airways to buy the airline BMI. IAG, which also owns Spain’s Iberia, has been given the go-ahead to buy its smaller rival from Lufthansa for £172.5m. But Virgin said that the Commission “seemingly ignored all of the strong cases” made against the deal. The deal is expected to take effect on 20 April, IAG has said. The sale of BMI to IAG was announced in December and regulatory approval was granted by the Commission on 30 March. BA will gain 56 more slots at Heathrow airport, although it has been forced to give up 12 slots as part of the deal. But Sir Richard Branson, president of Virgin Atlantic, criticised the Commission for reaching its conclusion in 35 working days. “This deal was agreed with lightning speed and we think the number of slots offered is derisory – representing less than a quarter of BMI’s former network,” he said. “We will challenge every aspect of this process which if allowed to stand, will undoubtedly damage the British airline industry for years to come. Virgin will bid for all the 12 slots that BA has been forced to give up, the airline added. IAG has said that the takeover could result in the loss of up to 1,200 jobs. Based in Castle Donington, in Leicestershire, it operates flights to Europe, the Middle East and Africa. It has 8.5% of the landing slots at Heathrow, the UK’s busiest airport. BMI carried three million passengers in 2011, excluding its regional services and low-cost airline BMIbaby. It flew to 34 destinations in 25 countries and had 27 aircraft, employing 2,700 staff, before the job cut announcement last week. BA carried 32 million passengers last year and flies to 151 destinations in more than 70 countries. It has 239 aircraft and employs some 37,000 people. Flight Global article (2007) about slot trading. “It is called secondary trading because the trades take place with slots that have already been given to airlines for free. The internationally-recognised system for allocating slots says that airlines retain the slots under so-called grandfather rights as long as they use them for 80% of the time in a given season. “IAG said its share of slots at Heathrow, consisting of take-off and landing rights held by BA and Iberia, would increase from 44 per cent to 45 per cent following the transaction with BMI. IAG added it would not need regulatory approval for the transaction. “BA is the largest holder of slots at Heathrow, followed by BMI. BA plans to use the six pairs of BMI slots from late October to expand its short- and long-haul services at the airport. Aer Lingus is also keen to buy some of the slots that BA has to relinquish. Lufthansa had blamed BMI for pushing it to a €13m net loss in 2011 and had warned privately that the subsidiary could be closed down if the European Commission did a lengthy probe into the IAG transaction, which was formally notified to the Commission on February 10th 2012. Sir Richard Branson’s airline Virgin Atlantic will appeal a European regulator’s decision to pass the owner of British Airways’ takeover of bmi. Virgin Atlantic said the deal will “cause serious competitive harm at Heathrow” and will place British Airways owner International Airlines Group (IAG) in a position of “total market dominance”. The £172.5 million takeover was approved by the European Commission 35 days after the deal was announced on the condition that IAG must give up 14 pairs of daily take-off and landing slots at Heathrow as a contribution to boost competition in the sector. The deal is set to lead to up to 1,200 job losses at bmi’s head office at Castle Donington in Derbyshire and at regional airports, although BA said that without the acquisition, all 2,700 jobs at bmi could have been lost. Virgin Atlantic will bid to operate all of the 12 remedy slots that BA has been forced to give up through the process, but said it alone is “completely inadequate” and called for more of bmi’s slots to be released. Sir Richard added: “This deal was agreed with lightning speed and we think the number of slots offered is derisory – representing less than a quarter of bmi’s former network. 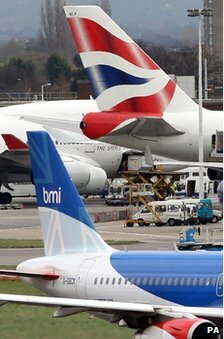 BA says it has began consultation with trade unions on the integration of the loss-making airline, bmi. IAG was given regulatory clearance to buy bmi from the European Commission 2 weeks ago. Bmi is losing more than £3m a week, is not a viable business, and, without the acquisition, was facing closure with the potential loss of all 2,700 UK based jobs. The consultation proposes the full integration of bmi mainline into BA securing approximately 1,500 jobs. The integration proposals could result in up to 1,200 redundancies. Jobs secured under the proposals include the transfer to BA of around 1,100 cabin crew, pilots and engineers based at Heathrow and up to 400 passenger services jobs at Heathrow Terminal 1. The UK redundancies will mainly be at Castle Donington and at regional airports. ABA’s parent company, IAG, has to give up 14 pairs of daily take-off and landing slots at Heathrow, in order for its take-over of bmi to be approved. BA gains 56 pairs of slots per day, so without the 14, is gaining 42 pairs, which will be used to expand BA’s operations at Heathrow with new destinations and more schedules. Seven of the relinquished Heathrow slots must be sold to operators providing flights to Edinburgh and Aberdeen. IAG must also provide competitors with access to seats on its UK and European services, allowing airlines such as Virgin to book journeys for passengers who wish to transfer on to its long-haul flights. Completion of the sale of bmi by Lufthansa is anticipated to take place around 20 April. Walsh said IAG would operate bmi’s published schedule in the short-term but soon expand IAG’s long-haul network, announcing new destinations in Asia. Posted: Monday, April 16th, 2012. Filed in General News, Recent News.